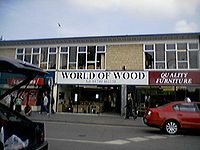 This is the store that supplies the world with wood. Wood is a mysterious material from the past given to us by the elk people of the planet Ike-a, used to make things like clubs so people could hit each other. Especially on holidays like 'wack a mole day', 'go hit your self day', and 'the day of furniture making' (celebrated in east china, and Pluto). Contrary to popular belief, it has been debated that wood is actually a natural material. In ancient times men were made from steel and ships were made of wood. In modern days, ships are made of steel and men are made from wood. Wood has many uses. A great underground rebellious force, similar in form to the Ewoks, has developed since it was determined that milk is better than wood. While the group recognises milk's vital use in tea they raise the point that without wood it would be impossible to warm tea and the fact that all biscuits are made of oak. Wood also makes an excellent stew. Wood Chemical Element 17 and valency of 2, wood is an element that has some rather strange effects. For instance when we burn wood we get two products formed - these being weebles and wobbles (ash). wood is also an anti-polar molecule, this is evident by its reluctance to associate with water which is polar. Take the humble apple. First discovered in 1878 by Sir Isaac Newton after his exahaustive work on gravity. The apple grows in trees which are principly made from wood. Since an apple is a fruit, it is neither animal nor vegetable, therefore fruit is a rock. Since fruit is a rock, ergo wood can produce rocks. We know this to be true since rocks aren't metals either. Above all, woods first and foremost benefit to mankind is the first thing I stated and that is the production of wood oxide. For the most part it is an utterly useless chemical but has one other benefit - fire. Fire is not only great fun but because wood oxide is so utterly useless, immensely fun to produce as it wastes wood, and as we all know, wasting things is fun. The Brazillian Government is so intent on producing this fun chemical that it is prepared to burn great swathes of rainforest - a byproduct of this is cattle farming which isn't nearly as fun. 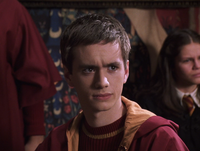 This piece of wood helped lead Gryffindor to their first Quidditch Cup win in more than 10 years. Primary food source for termites and giant squid. Central to an unhealthy woodchuck obsession. Helping Gryffindor win the Quidditch Cup. So as we can see, wood is one of natures most wonderful elements, along with junk and grub. I got wood right now. To purify wood oxide, dissove it in water (make a saturated solution), filter it or let it settle and drain off the clear liquid, and then add alcohol - methylated spirit will do. Hey presto! Purified wood ash precipitates out. It has no use at all, but it's kind of cool. Sorta. You can do a similar fun thing with tincture of iodine and supermarket ammonia, except the precipitate is black and makes noise. In episode 6 of Firefly, "Our Mrs. Reynolds", Jayne is given a wooden rain stick by a villager. In the Buffyverse, Buffy often slays vampires using stakes made of wood. The wand used by Harry Potter is made of wood from a Holly tree. The fence around the back yard of the house in The Simpsons is wooden. In the 2004 TV series Battlestar Galactica, there is an assumed use of tree bark. XKCD comic #446 references the "In Popular Culture" section of the Wikipedia article for wood. In Star Wars: Return of the Jedi, The Ewoks use wood in order to make weapons and houses. Your mom used my wood last night.